Off to the annual Carey Family Conference. Unfortunately I'll be the missing the launch of something exciting that I'm involved with. However, if you keep checking Esther's blog this week you'll hear about it! Finally got round to making a couple of cards this week... I have been mainly getting back into and enjoying cross stitching. I find I can do it whilst feeding babies - which is a bonus! 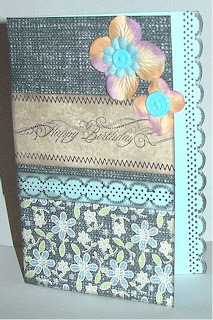 Used the midweek challenge from DCM... created faux ribbon with some lovely new stamps that were an absaloute bargain! Ingredients: PP, stamps and brads by HOTP, flowers by Prima. Sorry I've not posted for a while. Body is not quite recovered, got a lingering sore throat and achey body plus the general tiredness and soreness that accompanies having a new born baby. Mum and Dad are up for a few days which is lovely. Poor Jadon has conjunctivitus, but apart from that is doing really well, he weighed over 10lb last week, so all the milk I'm producing is doing him good!!! Will try to be creative soon! Will post a tiara picture soon, just got to wait till after Saturday so no one sees it before the bride wears it!